This year’s 12th Waterloo Festival for Animated Cinema, on November 15–18, 2012 at The Crysalids Theatre, 137 Ontario Street North, Kitchener, Ontario, Canada, will include Mamoru Hosoda’s The Wolf Children, along with more than eleven other animated features unreleased in North America. 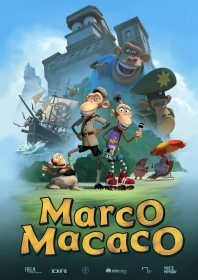 The list includes the 2012 Danish Marco Macaco (trailer) by director Jan Rahbek, featuring a tropical island full of anthropomorphic monkeys, a monkey policeman, monkey pirates, and a monkey Giant Robot. Here is a different trailer for "Marco Macaco". I may be grasping at straws, but this has so many tributes to the American animation 1940's style of gag work.